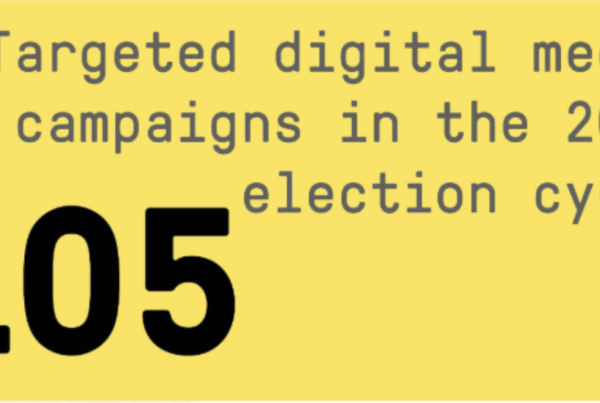 The 2018 midterms are finally over — and even though we’re all waiting for voter files across the country to update to truly understand the impact the work that was done last year, we wanted to get a head start digging into the role of campaign technology. Around this time last year, ACRONYM wanted to fill a gap in the adoption and implementation of good tech. 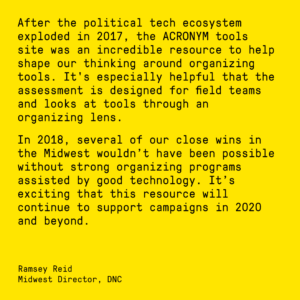 Our friends around the country were running campaigns and asked us what tools they should be purchasing and using — so we met with vendors, sat through hundreds of hours (literally) of demos, and dug into 55 digital organizing tools. 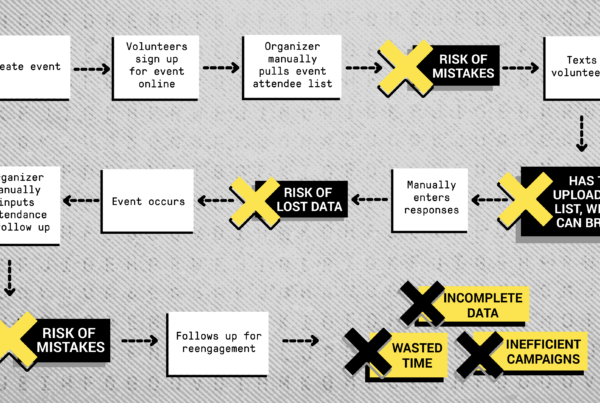 The end result: a publicly available guide written by organizers, for organizers, and meant to help campaigns match their needs to a tool. 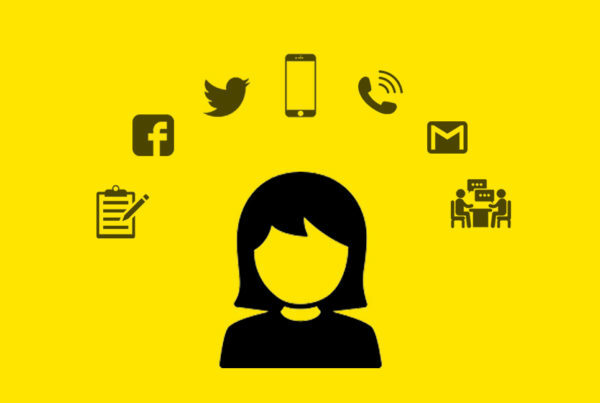 Our assessment covered what types of tools exist for campaigns, what they did, what their drawbacks were, and how much they cost. It was accessed by thousands of users, including campaigns, organizations, and nonprofits. We spoke with people at Planned Parenthood, NextGen, the DNC, EMILY’s List, America Votes, the National Democratic Training Committee, VAN, and many state parties to give tools recommendations. We’ve talked to campaign managers, organizers, data directors, digital directors, field directors, donors, vendors, and other decision makers. One reason we wanted to put together a public assessment was to provide transparency to the tools market, especially around pricing. We also wanted to translate tech speak into a common language for practitioners to make tools and tech more accessible for anyone. 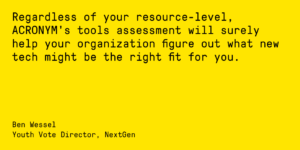 The second reason we wanted to put together this tools assessment was to dispel the idea that any tool is a silver bullet. No tool can replace an organizing program — at best, it can augment the work already done by people, whether they’re organizers or volunteers. We wanted to help educate buyers on what tools existed, which questions to ask vendors, what to be aware of (for instance, features that have been launched versus features ‘on the roadmap’). And now, one year later, we can see how different the landscape is. Hundreds of campaigns purchased and used new organizing technology. Some tools were easier to adopt and implement than others were. We spoke with campaigns and organizations across the country to figure out what worked and what didn’t — we even embedded in some of the most competitive Senate campaigns for the final month to dig in on how tools were being used and what pain points still exist. We spoke with organizers, activists, data directors, organizing directors, program managers, regional organizing directors, and other staffers to get their unfiltered thoughts about the tech that helped (or hurt!) their efforts to win the 2018 midterms. By providing feedback from actual practitioners, we hope we can continue to break down language barriers and provide useful information to folks considering tools. We updated the existing tools on the site with new pricing information, features, and more to reflect the most up to date versions of the tools. For instance — Flipgrid is now free to all users, and Team has a new “Team Chat” functionality! One thing you’ll notice in particular about the list of new tools that we’ve added is that we heavily focused on CRMs. The first round of the tools assessment was mainly oriented towards electoral campaigns using NGP VAN — but now that the midterms are over, we wanted to dig deeper into the advocacy tech space and other CRMs to expand our landscape of tools. Overall, political tech companies did a great job at landing contracts but not scaling adoption. We saw more reseller and distribution agreements than in any past cycle, but this did not necessarily lead to greater adoption on a campaign level. It’s necessary for campaigns, committees, and national organizations to have a plan to deploy tech before signing contracts. We still heard from too many director-level staff that their overarching committee purchased a tool for them that sat on the shelf for months because it was not part of their program and/or was not trained on in the right way. Pricing transparency is still a huge problem in political tech. Too many vendors do not provide uniform or public pricing models for their products. There are still too many platforms that are mobile app-only. On the macro level, this disincentives some activists from participating. The language barrier between campaign professionals and political tech entrepreneurs is still an issue — but we believe it’s becoming better. ‘User guides’ are not the same thing as staff trainings and program plans. Tech entrepreneurs need to understand that their platform is part of a greater stack and they should produce strategy documents that acknowledge this, rather than trying to oversell their products and imply that it 1) is the entire stack and 2) replaces a program. There’s good news here: we have time during 2019 to fix these trends and test out new tools and features. But if you’re a 2020 campaign, you should be thinking now about what kinds of tools you want for your organizers, whether you should build your own or go to a vendor, and what all the options are. 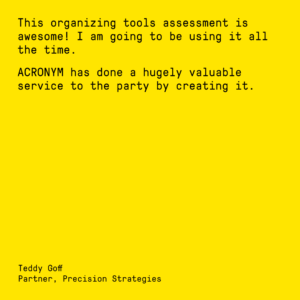 Our ACRONYM tools assessment has you covered — go check it out!